A non-compete agreement is a contract between an employee and an employer in which the employee agrees not to enter into competition with the employer during or after employment. These legal contracts prevent employees from entering into markets or professions considered to be in direct competition with the employer. 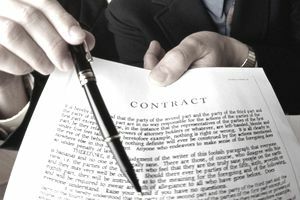 Noncompete agreements are enforced when a relationship between an employer and employee ends and the employer wishes to prevent the employee from competing against them in their next position, whether working for a competitor in the same market or starting up another business in the same field. Consultants and independent contractors who terminate their relationships with companies often are subject to noncompete clauses to avoid competition after the separation. Employers also may seek noncompete agreements to protect themselves against former employees revealing secrets or sensitive information about operations, clients, customers, formulas, pricing, strategy, salary, methods and practices, ideas, future products, or public relations and marketing plans. A non-compete agreement is typically in effect for a certain period of time after employment ends. It is important to determine these dates well in advance and to seek legal counsel, as employers can set noncompete agreements only within a realistic timeline and cannot permanently prevent former employees from furthering their careers in that field. There sometimes are challenges to whether non-compete agreements are legally binding. There isn't a simple answer. It varies from case to case and can depend on state law, on how restrictive the agreement is in terms of time and the radius of the region, and on what the employer construes as competition. Noncompete agreements usually are considered legally binding as long as they have reasonable limitations, such as clear, realistic regions where employees may or may not work, or an exact amount of time that must pass before an employee may commence work in the field again. However, the validity of non-compete agreements varies by state. Some states, such as California, North Carolina, and Oklahoma, disregard these agreements altogether, while others pick and choose which careers prove more risk for a company and, therefore, can be subject to such an agreement. An effective date on which the agreement will begin. A reason for enacting the agreement. Specific dates during which the employee will be barred from working in a competitive sense and the location covered by the agreement. Details as to how to the noncompeting party will be compensated for agreeing to the terms. These contracts also are known by the terms noncompete, noncompete clause, noncompete covenant, covenant not to compete. An example of a non-compete agreement might involve a company that is one of only two or three such companies in a market that offers a specific product or service. The company may ask salespeople to sign a non-compete agreement because they don't want those salespeople going to a direct competitor and trying to take their client list with them. Another example might include a software company that doesn't want its developers going to a competitor where they can share detailed knowledge about products being developed. What Is Included in an Employment Contract? Must You Give Two Weeks Notice? What Is an Hourly Employee?